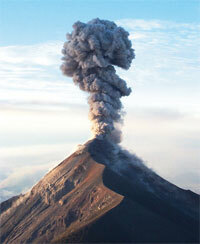 MAJOR volcanic eruptions can disrupt rainfall patterns over the Asian monsoon region. A study has shown that big eruptions tend to dry up much of central Asia, but bring more rain to southeast Asian countries like Vietnam, Laos, Thailand and Myanmar—the opposite of what many climate models predict. Researchers at Columbia University’s Lamont-Doherty Earth Observatory in the US studied growth rings of centuries-old trees from about 300 sites across Asia to measure the effects of 54 volcanic eruptions, going back about 800 years, on rainfall. Most trees expand by adding growth rings. They may also grow wider or narrower according to the changing yearly temperatures and rainfall. The tree rings showed that huge areas of southern China, Mongolia and surrounding region consistently dried up in the year or two following explosions, while mainland southeast Asia received heavy rainfall, according to the study published in the October issue of Geophysical Research Letters. Volcanic explosions can affect the weather by spewing massive amounts of sulphur compounds into the atmosphere that block solar radiations and cool the air. The cooling can last for months or years. The lowered temperatures decrease evaporation of water; and less water vapour translates into less rain. This phenomenon is complicated by atmospheric circulation patterns, cyclic changes in temperatures over the oceans and shapes of land masses, said Kevin Anchukaitis, the study’s lead author. The authors said there could be a link between the impacts of eruptions and El Niño-Southern Oscillation, a climate pattern that affects temperatures over the Pacific and Indian oceans. Strong El Nino episodes could lessen the drying and moistening effects of eruptions, or exacerbate the impacts to create devastating droughts or flood. “More work is needed to understand how these forces interact,” said Rosanne D’Arrigo, one of the study’s authors. M Rajeevan, a scientist at the National Atmospheric Research Laboratory in Tirupati in Andhra Pradesh, said, numerous factors affect climate, and their interactions always leave space for uncertainities in simulations of current models. “Volcanic eruptions affect the climate for a short period, making simulation a complex task,” added Rajeevan. This study is, one should know, entirely bogus. Correlation of tree rings to rainfall is right enough, but records of volcanic eruptions (their size, the time of year, the direction of their ash deposits, duration, etc.) are sparse and highly specultative.